When you live with someone, you don’t always notice big or small changes right away. Hadley’s entrance to puberty has been fairly gradual (despite shooting up the summer before fifth grade and being a foot taller than everyone). Almost overnight, I started getting a lot of comments about Bode. And then I tuned in that they were right! That boy of mine is entering teen-dom. He’s still really easy-going and sweet but there is definitely the occasional dose of moodiness. He has taken more care in his appearance and actually started styling his hair this year. 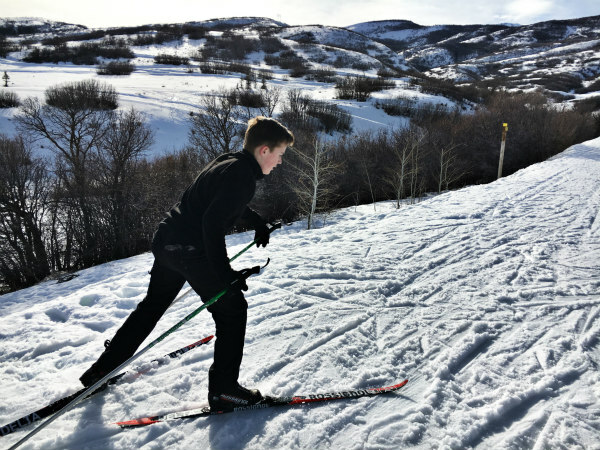 For the first time in his life, he’s interested in eating healthier and has put himself on a fitness regimen by running on the elliptical for a mile every day as he tries to get in great shape for soccer and summer ski season. WHAT?! I can find awesome brand-name clothes at a thrift shop in Provo and have always done his shopping for him because he just hasn’t cared…until last week when I came home with a haul of clothes and he said he wanted to come with me from now on to pick them out. Fortunately, there was only one shirt he didn’t like, which is a far cry from Hadley who hates 95% of what I buy for her…and that is why I don’t shop for her anymore. He hasn’t surpassed me in height–yet– but the countdown is on. Last week, he was really tired and a bit grumpy racing out the door in the morning. I soon realized he forgot his lunch so I drove to meet him at the bus stop. He sheepishly and affectionately thanked me, grabbed his lunch and I caught a glimpse of my little boy as my teenager walked to the bus. These are tough years for mamas but what a wonderful young man he is becoming. Steamboat Springs for Spring Break: Oh, What a Relief It Was! A Backcountry Yurt Couple’s Retreat for Valentine’s Day!